The synagogue at Edirne, restored for $ 2.5 million - but where are the Jews? ISTANBUL — For Rafi, a local newspaper’s anti-Semitic crossword puzzle was the final affront. He knew he had to leave Turkey. Rafi is one of thousands of Sephardic Jews in Turkey who trace their ancestry to Spain and are now applying for Spanish citizenship in anticipation of a parliamentary bill expected to pass this month in Madrid that would grant nationality to the Jews who were expelled in 1492, during the Inquisition. Most are seeking visa-free travel within Europe and an opportunity to escape what they see as rising anti-Semitism in Turkey. But many are taken with the idea of reversing the trek their ancestors took centuries ago as they escaped persecution in Spain and settled in the more tolerant environs of the Ottoman Empire. “Jews are attacked all over the world, but last year the level of hate speech in Turkey reached an unnerving level,” Rafi said. During the 15th century, about half a million Sephardic Jews sought the safety of the Ottoman Empire, and they prospered there under the rule of Sultan Bayezid II. But since the beginning of the 20th century and the founding of the Republic of Turkey in 1923, Turkey’s Jewish population has been in sharp decline. A discriminatory wealth tax in the 1940s introduced by a secularist government, along with the establishment of the state of Israel, reduced the number of Jewish residents by tens of thousands. Those who stayed faced pressure to assimilate, and Turkish quickly replaced Ladino, the Judeo-Spanish language of Sephardic Jews. Today, only a small portion of older Sephardic Jews speak the language of their forebears. Over the past decade, under the government of the Islamist-rooted Justice and Development Party, and pressured by a string of deadly terrorist attacks on synagogues and a surge in anti-Semitism, the Jewish population — the vast majority of whom are Sephardic — has shrunk to 17,000 from 19,500 in 2005, according to figures obtained from the chief rabbinate in Istanbul. Although Jews have felt increasingly uneasy over the past two years, Selin Nasi, a columnist for Salom, a Jewish weekly, acknowledged that Turkey had taken some positive symbolic steps to improve relations with Jews. 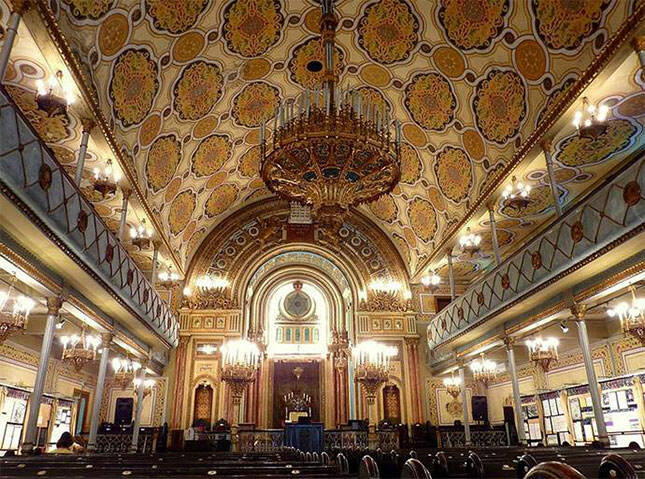 The Turkish government spent $2.5 million on a project to restore the Great Synagogue of Edirne and participated in the United Nations’ Holocaust Day for the first time this year. At a rally last year, President Recep Tayyip Erdogan asserted that he was the first Muslim leader to denounce anti-Semitism. He has, however, engaged in heated exchanges with the Israeli leadership, primarily over Gaza. Some analysts say that those disputes, combined with his dissemination of conspiracy theories that often implicate Jews, have encouraged anti-Semitism. Apprehension among Jews in Istanbul rose in 2013, after Mr. Erdogan accused an “interest rate lobby” of backing widespread antigovernment protests that were supposedly meant to bring down the economy and topple his government. According to a poll conducted in July 2013 for the Anti-Defamation League, 69 percent of Turks harbor anti-Semitic attitudes. During the war last summer between Israel and Palestinian militants in Gaza, pro-government news outlets in Turkey began a series of anti-Semitic social media campaigns that stoked anti-Jewish sentiment. After a Turkish singer posted “May God bless Hitler” on Twitter, Melih Gokcek, the mayor of Turkey’s capital, Ankara, who has over 2.5 million followers, responded, “I applaud you,” and he encouraged others to chime in. Many Turks put the blame for the rise in anti-Jewish feelings on the actions of the Israeli government, particularly the killing of civilians during the Gaza war. “If the Turkish Jewish community does not put an end to Israel’s actions, very bad things happen,” Bulent Yildirim, president of the IHH Humanitarian Relief Foundation, wrote on Twitter. But in the eyes of most of the Jews who were interviewed, that amounts to collective punishment. “When lashing out at Israel, the government condemns Jews without making a differentiation, which incites hatred toward the community,” said Mert Levi, 26, a Sephardic Jew who left Turkey for a few months last summer because of the tensions he felt in Istanbul. In Bursa, the northwestern province where the first Sephardic Jews arrived by sea in the 16th century, only 65 Jews remain, most of them advanced in age. Over the decades, thousands of families have moved to Istanbul and Izmir, a southern city, to seek better work and education prospects. There is definitely a bias in favor of Muslims in international diplomacy, including that of Western powers, such as USA & UK, and in the Western press. Nobody writes that up to circa 1400, the city of Edirne mentioned in the article, was Greek-speaking and called Adrianople. Istanbul of today was also Greek-speaking and called Constantinople, Izmir was Smyrna, etc. Now if Turkey were treated like Israel, we would read that info all the time whenever reports come in from Turkey. Moreover, we would hear about the Armenian genocide and the fact that Istanbul had a majority non-Muslim population --probably the Greeks there were a majority alone-- before WW I. The Greeks were driven out of Smyrna in 1922 and the surviving remnant of Greeks in Istanbul, maybe 50,000, were driven out by pogroms in 1955, leaving just a few thousands today. Why don't we hear about a Greek Nakba? Why are we not constantly reminded of the Turkish occupation of northern Cyprus which took place as recently as 1974 and which created some 200,000 Greek Cypriot refugees who have not been allowed back to their pre-1974 homes? All of this shows that the moralistic arguments against Israel are vicious, interest-driven and/or Judeophobia-driven hypocrisy. Indeed, the EU, far from combating the Turkish occupation in Cyprus --an EU member no less-- collaborates with Turkey and the "Turkish Republic of northern Cyprus" to develop the area and settle people there. As to Turkish Jews, the original Greek-speaking Romaniot Jews there were oppressed and displaced/deported at the time of the Turkish Muslim conquest, many years before the Sefardim arrived, although some of those original communities survived. Moreover, during the Nazi period there was considerable sympathy for the Nazis in Turkey --including among Ataturkists-- and consequent oppression of Jews, all of this unknown to the New York Times. On the other hand, I am told by some Israelis related to me by marriage, some of whose family were Jews from Turkey, that the Ataturk period was much better for Jews than the preceding period of Sultans and rule by Muslim law. So much for traditional and historic Turkish tolerance. Hypocrisy, thy name is Europe. Keep in mind that Spain is barely less antisemitic than Turkey. Erdogan's claim that he has denounced antisemitism has to be one of the howlers of the day. He owns a large portion of Turkish media and was a prime mover and shaker behind the Gaza flotilla of 2010 along with the notorious Mahatir Mohammed of Indonesia who blamed everything from captialism and human rights to communism on Jews. Just 15 years ago, relations with Turkey were so tight, a telethon was organized on Israel TV to raise money for the victims of a terrible Turkish earthquake that happened that year and the Israeli rescue team was sent. Moreover, Turkey was at the time a preferred destination for Israeli tourists. Things began changing as soon as Erdogan took office. What happened is that he improved relations with Arab countries who began investing heavily in Turkey and he obtained preferred ally Status from the Obama administration. He didn't need Israel anymore. To cement a public break and signal the change to the Arab countries, he decried a "Gaza genocide", had a very public fight with Shimon Peres I think in Davos, encouraged sending the Mavi Marmara knowing there will be trouble, and also got some help from the Israeli side when then deputy Foreign minister Danny Ayalon said some humiliating words to the Turkish ambassador in Israel. Turkish Jews are experiencing savage antisemitism initiated by the Islamist government because it's their interest at this moment. Highly important interview with Haj Amin el-Husseini, the chief Palestinian Arab leader in the 1920s, 1930s, and 1940s [British-backed to be sure]. This was in 1944 for a Vichyite newspaper in Paris. He reveals himself to be a pan-Arabist, not any sort of "palestinian" nationalist, and yearns for Arab unification. I think that on this he fairly represented the opinion of the Arabs in the country. In other words, what they wanted was not some separate state to be called "palestine" but a great pan-Arab state. From other documents that we have concerning him, it seems that he believed himself fit to be a leader or the leader of that great pan-Arab state. Moreover, the charter of the PLO is basically a pan-Arab document, and people should read it and see for themselves. For Anon, Erdogan's partner was Mahathir Muhammad of Malaysia, not as written. Le Petit Parisien of 11 August 1944, as the Allied armies were approaching Paris. The interview with Husseini is featured on the upper right of the front page. The headline is: "La nation arabe realisera son unite malgre tous les obstacles"